"Itâ€™s 4 a.m. Do you know where your car is?" 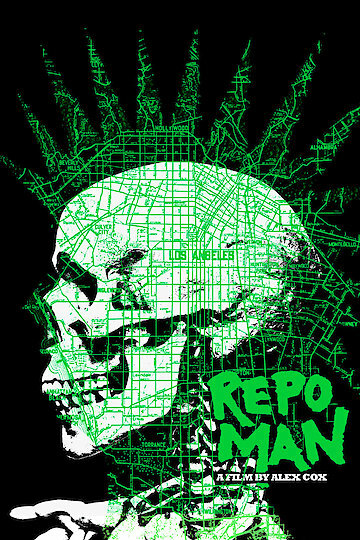 Repo Man (1984) is a mix of science fiction and comedy that takes place in California. Otto Maddox, a punk rocker, is having a bad day when he is offered some money to drive a car. He is then confronted with the opportunity to become a repo man. The prospect of a new job and meeting a girl drastically changes Otto's life. When a $20,000-bounty on a Chevy Malibu and a picture of aliens appear, Otto becomes entangled in several people's schemes to get to the trunk of that Malibu without knowing what will happen when it is opened. Repo Man is currently available to watch and stream, buy on demand at Amazon, Vudu, Google Play, iTunes, YouTube VOD online.